MaxtoCode is a professional product for .NET encryption. It is not to confusion or a kind of Shell software, it is a encrypting product aiming at kernel.It with its low price and highly secure protection let you get much more than the price. Guitar-Online Tuner - This guitar, mandolin, ukulele, fiddle, banjo, bass guitar tuner allows standard and open tunings. Audio SixPack - Audio SixPack WILL HELP you to convert your audio CD collection into the DVD-Audio standard WITHOUT QUALITY LOSS. Using Audio SixPack you will be able to write 6 audio CDs ? ?” at the standard 44.1Khz/16bits ? ?” to 1 DVD-audio disk. PADbased_UpdateChecker - PAD is a submission standard for authors but is much more functional. This program scrutinizes all PAD-based programs for latest updates and can be compaired with harddisc versions. If an update exists it can be downloaded with one mouseclick only. The Mystic Eye Tarot Calculator - A fun, fully functional tarot themed calculator complete with graphics, animation, and sound. Use your mouse or keypad. Tarot cards replace the standard keys. Fun yet practical, replace your standard Windows calculator today! 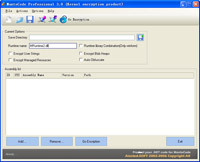 DoneEx AppBinder ActiveX - This ActiveX library allows you to organize data exchange between any programs which use the standard input/output streams. You can start any DOS or Win32 Console program and use its standard input/output streams data in your application.